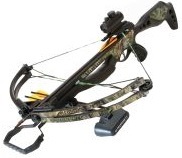 The following section contains crossbow reviews and comparisons, prepared by our x-bow experts. Each crossbow is also rated using a scale from 1 to 10, but keep in mind that these ratings are subjective and reflect only the opinion of the person reviewing the model in question. For crossbow reviews arranged by manufacturer, scroll down to the bottom of the chart below. You can also check out our list of the best crossbows arranged by price range. I’ll do my best to get my hands on one and have it reviewed. I’ll ping you when it’s up!